HIV-related point-of-care testing (POCT) technologies have become widely available, and they serve as a catalyst to attaining the UNAIDS-led 90-90-90 HIV treatment targets  by improving access to diagnostics in resource-limited countries. The treatment targets aim to accomplish specific goals by 2020 – the first 90-target being that 90% of people living with HIV know their HIV status. Increasing access and maintaining the high-quality of POCT is essential to better patient outcomes and achieving an AIDS-free generation. 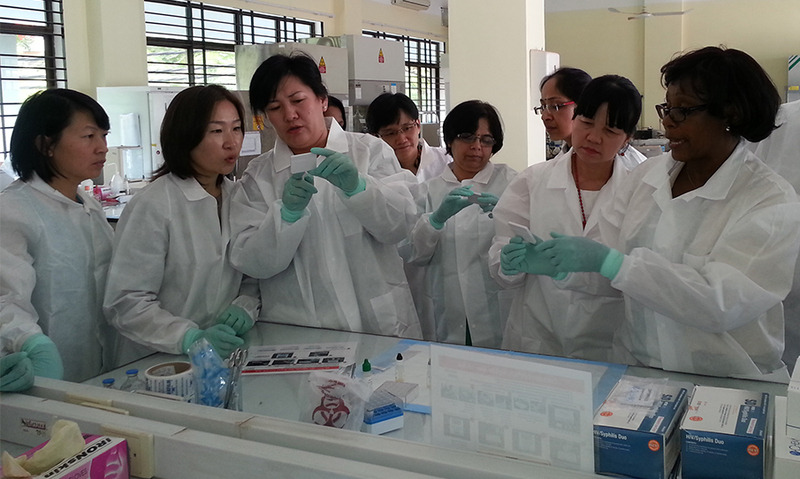 In its continued efforts to improve the quality of POCT, the African Society for Laboratory Medicine (ASLM) recently partnered with the World Health Organization (SEARO and WPRO regional offices), PEPFAR, the US Centers for Disease Control and Prevention (CDC), and other global partners, to organise a regional consultation in Phnom Penh, Cambodia, aimed at improving the quality of HIV and syphilis POCT. ASLM had hosted a similar POCT consultation in Dar es Salaam, Tanzania, for African partners in June 2014, and regional partners of the Caribbean conducted a consultation in October 2014 to focus on quality and access to HIV-related POCT. Stakeholders in Phnom Penh reviewed the current status of HIV-related POCT quality assurance and introduced the new World Health Organization/CDC guidance document, “Handbook for Improving the Quality of HIV-related Point-of-Care Testing”. This key guidance was launched at the ASLM2014 conference and establishes a new benchmark to ensure the provision of high-quality HIV-related POCT. Based on these recommendations, all stakeholders are called to improve the quality of HIV-related POCT programmes, including HIV Rapid Diagnostic Tests (RDTs), CD4, Early Infant Diagnosis (EID), Viral Load (VL) POCT, and other HIV-related POCT. With this framework, the regional consultation led to the development of the “Phnom Penh Statement” – an endorsement of the 90-90-90 treatment targets and a call for local governments to acknowledge that access to high-quality HIV-related testing is a human right for all. To address the weaknesses in current POCT quality assurance (QA) programmes, it is important to identify key activities that guide the planning and implementation of sustainable quality-assured POCT. Greater emphasis must be placed on certification of POCT staff and sites, enhanced QA human resource networks for POCT (supervision and corrective action), and establishing more comprehensive data collection analysis through innovations in data connectivity. The global health community has embarked on an ambitious goal to end AIDS by 2030 , and momentum from key initiatives such as the UNAIDS-led 90-90-90 HIV treatment targets bring this goal within reach. The Phnom Penh Statement is an important step on this pathway towards an AIDS-free generation globally.